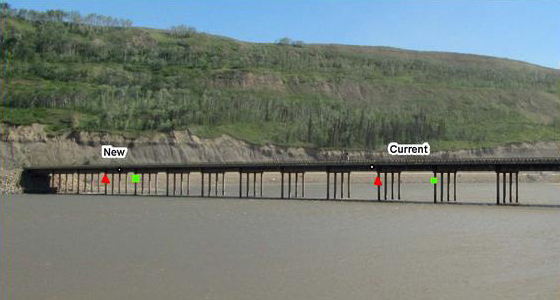 FORT ST. JOHN – BC Hydro is advising boaters and river users that the navigation channel in the main stem of the Peace River that passes under the temporary Site C construction bridge will be moving on Sunday, August 19. Due to changing river conditions, the navigation channel will be shifted approximately 50 metres closer to the north bank of the Peace River. The navigation lights and markings on the construction bridge will be moved to reflect this change. Please exercise caution when navigating the Peace River at and around the dam site for safety reasons. The navigation channel through the construction site is dynamic and may continue to change during the construction period based on river conditions and water flows. Please watch for signs and lights that indicate the navigation channel. The navigation channel will be shifted approximately 50 metres closer to the north bank of Peace River (left side of image).